Tracking a major trend, F&W’s Kate Krader goes to a U.S. taco capital—San Diego—and discovers incredible things to eat morning, noon and night. Here’s what most people pack when they travel to San Diego: their cutest bathing suits; their state-of-the-art triathlon gear (San Diego is the birthplace of the modern-day triathlon and one of the country’s top multisport cities); and their best X-Men costumes to march around in at Comic-Con (the entertainment-themed convention brings in around 130,000 people each summer). I put none of those things in my suitcase. Instead, I packed a couple pairs of yoga pants and some other stretchy clothing. I was headed to San Diego to go on a taco diet. While the food scene around the country has gotten exponentially better in the last decade, San Diego didn’t seem to be paying attention. Other cities trumpeted the rediscovery of obscure Italian regional food traditions or a breakout modernist star chef. In San Diego, the talk was of tacos and beer. There’s a reason for that, I discovered: Several years ago, a bunch of ambitious restaurants opened there. And then many of them closed. Subsequently, lots of the area’s cooks decided to focus on what they knew best. Why not start making incredible tacos? Empellón al Pastor will be open from noon to midnight every day; Stupak anticipates serving 5,000 tacos a week, or about one per minute. He got me thinking about eating tacos morning, noon and night: a taco diet. San Diego seemed like the place to try it—at shacks, high-end restaurants and anywhere else I could get my hands on tender tortillas with amazing toppings. My taco diet started on a 20-minute line at Carnitas’ Snack Shack (2632 University Ave.; carnitassnackshack.com). People wait patiently in the sun on a gritty street on the outskirts of San Diego; they order at the window of the wooden hut and move to shady seating in the back, where there’s also a small bar that specializes in local and Mexican beers. The place opened in 2011; owner Hanis Cavin named it after his mini pet pig, Carnitas Speck (Cavin swears she’ll never be eaten). Every week he produces about 2,500 pounds of carnitas—the crispy, fatty pork chunks—in one oven that runs all day and night. “Twenty-four hours a day, carnitas are cooking,” he says. Hanis first braises the meat in orange juice and Coke, then uses the reduced liquid as a glaze when he fries the pork. There’s a generous mound of the magnificent carnitas on each taco, with just a little salsa and guacamole. I don’t know how it isn’t the best seller—every meat lover in America should try this taco—but the Triple Threat Pork Sandwich (with carnitas, bacon and schnitzel) is more popular. Two Snack Shack carnitas tacos cost $7.50, which is a bargain. At Oscar’s Mexican Seafood in La Jolla, about 10 miles up the coast from San Diego, the battered fish taco I got was an even better deal at $1.99 (703 Turquoise St. oscarsmexicanseafood.com). The spicy shrimp taco with juicy, fresh pico de gallo was a couple bucks more, and it was better yet. Owner Juan Montes de Oca says he makes the shrimp so good by dousing them with a mixture of chopped garlic, soy sauce, Worcestershire sauce and plenty of crushed red pepper, which gives them a great slow heat; the tortilla he serves them on is quickly grilled, with a discreet layer of white cheese melted into it. I ate mine in front of the turquoise mural that covers Oscar’s facade; part of the mural depicts a lunch truck, an ode to the first incarnation of the place. Montes de Oca told me that he used to eat tacos for breakfast, lunch and dinner (yes! I thought), and still has them at least once a day, sometimes driving over the border into Tijuana to grab one. That mural notwithstanding, Oscar’s isn’t a particularly scenic place to eat—it’s located on a block that specializes in auto repair. Bull Taco in Cardiff is set in a campground above a Pacific Ocean beach; it’s got what must be the world’s best view from a taco stand (2050 S. Coast Hwy. 101, Cardiff by the Sea; bulltaco.com). Part of a fledgling chain with five (soon to be six) locations around the San Diego area, Bull Taco embodies a certain SoCal spirit: Its tagline is “inauthentic Mexican,” and it sponsors pro surfers, skateboarders and motocross riders. (Owner Greg Lukasiewicz recalls that this started when a pro surfer asked if he could be on Team Bull Taco. When Lukasiewicz asked what that entailed, the surfer said, “Just give me food.”) I was the only person who would not have been mistaken for a surfer when I hit Bull Taco; the majority of the crowd had no shirts and no shoes and talked more about the waves than their food. The menu offers about a dozen choices, like SBC (shrimp, bacon, chorizo) and duck with cabbage (Lukasiewicz was once a chef). An enthusiastic cook working the grill recommended the Fish of the Day taco, which was sesame sea bass. The chunks of seared sesame-coated fish were juicy, piled high with cabbage slaw and topped with a spicy pale-pink sauce. “Dude,” said the cook, “that’s Sriracha sour cream. Killer.” Yup. Tacos are such an obsession in San Diego that sophisticated restaurants have found ways to feature them. At George’s at the Cove in La Jolla, Trey Foshee (an F&W Best New Chef 1998 and, I should note, a good friend of mine) has begun serving a reservation-only, 14-course, $170 tasting menu called TBL3 at one of the oceanside tables in his elegant, glass-walled dining room (1250 Prospect St.; georgesatthecove.com). Each course is announced on a little card that’s slipped into a rack on the table. My meal started with caviar-topped potato mousse with seaweed “glass,” and featured several other inspired courses, but the dish that gets the most comments, says Foshee, is the two small fish tacos he serves halfway through the meal. Mine were filled with thinly sliced, citrus-cured Thai snapper with roasted pineapple salsa, avocado slivers and a kind of chicharrón made from the crisped snapper skin. The tortillas had remarkable corn flavor, flecked with pieces of masa. Foshee told me that he’s been hard at work on his tortillas because he’s opening a Mexican place, Galaxy, near the beach in spring 2015, where he’ll serve a variety of tacos, from battered fish to carne asada with smoked bone marrow. When I last saw him, Foshee was anticipating the arrival of a masa grinder from Mexico City—Phase Two of his tortilla immersion process. As good as the San Diego tacos were, the most genius ones I’ve ever tasted were about an hour north in Costa Mesa. Taco María is tucked into a corner of a high-end food hall with the alarming (to me) name The OC Mix (3313 Hyland Ave.; tacomaria.com). Chef Carlos Salgado oversees the open kitchen of the 20-seat, white-walled dining room; he grew up working at his family’s casual Mexican restaurant La Siesta in North Orange County (“I was their clumsiest employee,” he says). After a stint in high tech in the Bay Area, he decided he liked restaurants better and went to cook with James Syhabout at Commis in Oakland. When he returned to Southern California, Syhabout introduced him to Kogi BBQ’s Roy Choi (the two met when they were F&W Best New Chefs 2010), who helped convince Salgado to launch a taco truck. The brick-and-mortar restaurant opened in 2013. During the day, the menu is focused on exceptional tacos, like fried fish with charred-scallion aioli and thin slices of grapes. The potato and mushroom “chorizo” taco, made with rich minced shiitakes, has such precise flavorings that I refused to believe it was vegetarian. When I’d first planned my trip to Taco María, it wasn’t for my lunchtime tacos. It was for the four-course tasting menu Salgado serves four nights a week. The Los Angeles Times’ inimitable restaurant critic, Jonathan Gold, had raved about it, and spectacular dishes kept showing up on my favorite Instagram feeds. Still, I was nervous. I wanted to stay in the taco zone. I was in luck. 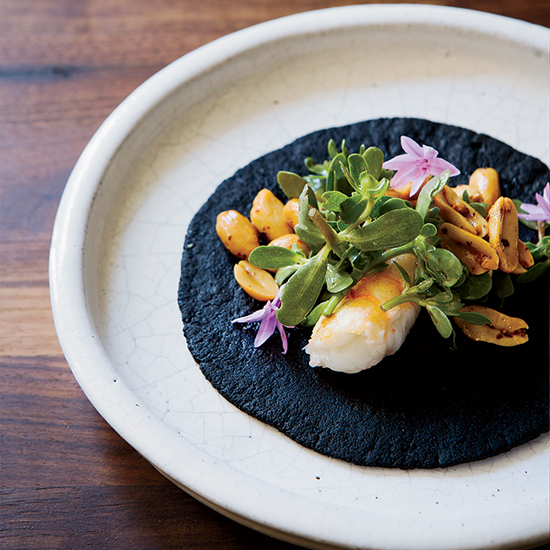 The second course of my tasting menu was the taco de camarón: a fat spot prawn, sprinkled with peanuts and clumps of the succulent green purslane, served on a squid-ink tortilla. The sautéed shellfish was sweet and fresh, the seasoned nuts had terrific crunch and the tender, jet-black tortilla tasted a little like the ocean. The waiter remembered how much I loved the smoky chile de árbol salsa at lunch and brought me a little bowl of it to drizzle on top. I’d found my perfect taco. The next day, I decided that perhaps I should take a break from tacos, so I went to the beach. I lied when I said I didn’t pack a bathing suit.